When you are looking for a Home Equity Line of Credit consider asking the following questions based upon a Federal Reserve article. Home Equity Lines of Credit can have risky features that could make it difficult for you to repay your balance. Remember that failure to repay your home equity credit line could cause you to lose your home. Shop around various lenders and find the best line of credit terms that meet your borrowing needs without unduly risking your home. Ask your lender about other loan products, such as a traditional home equity loan. Can my interest rate increase? Home Equity lines of credit (HELOC) usually have a variable interest rate, which means that the line of credit rate can increase or decrease from time to time. A lender may offer you a lower initial "introductory" interest rate for a short time, such as 6 months. However, after this introductory period ends the HELOC rate will usually increase. Can my minimum payment increase? Yes, your minimum payment can increase based on several factors, such as when your variable interest rate increases or you borrow more money on your home equity credit line. 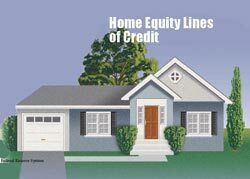 There are many home equity line of credit calculators available on the internet. It would be wise to do some financial what if’s and put various rates and loan balances into the calculator to see what your payments would be and how long it might take to pay off your line of credit balance. When can I borrow money? You can borrow money only for a specified time, starting when you open your account. During this time, known as the “borrowing period,” you can borrow money and you must make minimum payments. When the borrowing period ends, you will no longer be able to borrow money from your home equity line of credit. How soon do I have to pay off my balance? After the borrowing period ends, under some HELOC plans you may be required to pay off your balance immediately in one payment. Under other plans you will have a certain amount of time to pay down your balance. During this time, known as the “repayment period,” you will not be able to borrow additional amounts and will have to make larger minimum payments than during the borrowing period. Will I owe a balloon payment? Under some plans, if you make only the minimum payments you will not pay off your entire home equity loan balance by the end of the term. At that point, you will have to pay the remaining balance as a single lump-sum, known as a “balloon payment.” If you cannot get another loan to repay this amount, or pay it off using your savings, you could lose your home. Do I have to pay any fees? In addition to the lenders application fee, you may be required to pay four(4) types of fees for your line of credit: (i) fees to open your account, such as loan origination or property appraisal fees; (ii) fees to maintain your account, such as an annual fee; (iii) fees to use your account, such as a cash advance fee; and (iv) penalty fees, such as late payment or over-the-credit limit fees. Should I get a home equity loan instead of a line of credit? With a home equity loan, the homeowner can borrow a fixed amount of money at a fixed interest rate. This means that your finance rate and minimum payment will stay the same over time. Consider a home equity loan if you plan to borrow a fixed amount of money at one time and want to know the exact amount of your minimum payment. Consider a home equity line of credit if you plan to borrow different amounts of money over time and can afford higher payments, even if the interest rate on your line of credit reaches its maximum. 2009/20090723/heloc_keyQs.pdf, a publication in the public domain. equity_english.htm, a webpage in the public domain. Copyright © 2008-Present by CreditAlmanac.com - All Rights Reserved.